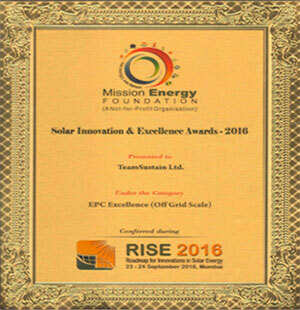 Kochi based TeamSustain has been awarded the Solar Innovation & Excellence Award 2016 by Mission Energy Foundation, Mumbai for the category of Innovation Project (Off- Grid scale). The award was received by George Mathew, Chief executive, TeamSustain from Mr. Ashwinkumar Khatri, Director General of Mission Energy Foundation in the RISE 2016 award ceremony held in Mumbai recently. TeamSustain is the only firm which got the award from South India. They had won two Inter Solar award in 2014 and 2015 respectively. Mission Energy Foundation is a not-for- profit endeavour based in Mumbai. They are a micro-enterprise initiative that strives to spread knowledge in the globalising energy sector and technology awareness through ongoing contacts and discussions with the public and industry. 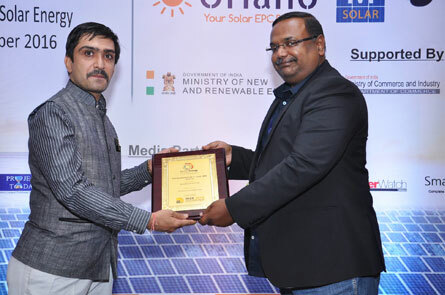 This category of award was to honour innovative products and solutions for better development of the solar industry. TeamSustain qualified for this Award due to the pioneering efforts and track records and was responsible for setting the highest quality standards in terms of designing & engineering using world-class components, installation and commissioning process. Some of the prominent EPC Off-Grid projects that contributed to our recognition are Hibiscus Villa (Kumarakom), Spice Village, Kumali (Casino Group of Hotels), Malankara Plantations, Rural Telecom, Soneva Fushi Resorts (Maldives), Smart Schools, Solar Rural Electrification (Mudanmudi, Idukki). TeamSustain is consistently one of the most honoured and recognized companies in the Solar Industry and winner of several prestigious awards since its inception in 1994.